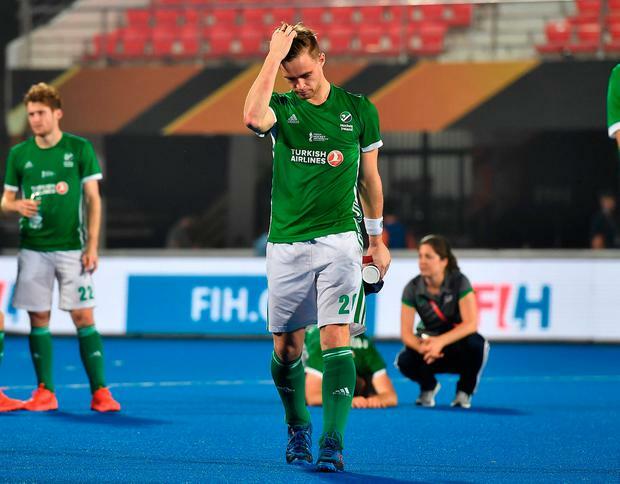 Ireland were held to a 1-1 draw against China on a frustrating outing at the Hockey World Cup in Bhubaneswar. Alexander Cox's side dominated for large periods of the match and created more clear-cut scoring chances, but Caiyu Wang in the China goal kept Ireland at bay for the most part. Ireland lost their opening game 2-1 to Australia, and although they will be disappointed not to have won today, the draw still keeps their hopes of reaching the knockout stage alive. Despite Ireland being on top, it was China who took the lead with three minutes left in the third quarter. Jonathan Bell was yellow carded for a robust challenge, which gave China a penalty corner. The ball was worked to Guo Jin, whose shot off the left post beat David Harte in the Ireland goal. Ireland showed impressive resolve to hit back one minute later, with Alan Sothern equalising from close range with a powerful drive. Ireland almost snatched a winner in the dying moments, but Caiyu Wang made a strong save from a penalty corner to preserve a 1-1 draw for his side and leave Ireland frustrated. Ireland now face England on Friday, with a draw good enough to send them through to the knockout stages.